Project Loon explained: Can Google's balloons unite the world online? A load of hot air or an idea of stratospheric magnitude? Project Loon: will it work? When Google first announced Project Loon back in July, we had to check the calendar to ensure it wasn't another of the company's elaborate April Fools' gags. Thousands of balloons on the edge of space, floating around the globe on stratospheric wind currents, self-aware and conscious of each other's movements like a flock of birds, sounded outlandish enough, but beaming Wi-Fi down to remote or underprivileged black spots? Pull the other one, chaps! However, as we listened to the pitch, the derision evaporated. Yes, this idea seemed beyond crazy – its absurdity is even acknowledged in the name – yet somehow still plausible. In Loon's case, the premise is so crazy that it just might work. On a small scale, at least, recent tests in New Zealand have shown the idea, from Google's secretive X Labs, does work. Google estimates there are 5-6 billion people around the world without access to the internet. The majority of people on the planet are completely devoid of connectivity through poverty, a remote locale, a lack of infrastructure and, in some cases, all three. Google's vision for Project Loon procures schooling for those currently without education, brings doctors for people who cannot travel to see one, and provides important weather data to assist farmers, whose harvests are affected by droughts and floods. Illiteracy, Disease and Famine could be dealt a swift and telling blow with a little Wi-Fi and according to Team Loon, balloons stationed so high above the earth they can only be seen with a telescope, is the most affordable and best way to achieve this. "The materials are pretty inexpensive," says Project Loon's Richard DeVaul. "The plastic of the balloons is similar to that in shopping bags and the electronics aren't that different from consumer electronics. This is a very cost-effective way to connect the world." Give a child a balloon and maybe they'll smile for a day. Give them one with Wi-Fi and the possibilities, Google hopes, are limitless. What is a Project Loon? Naturally, the balloon itself is not just your average birthday party accoutrement. These massive structures are 15-meters wide and made a from polyethylene film that's only three times thicker than a supermarket carrier bag, but still thick enough to withstand high altitude air pressures without exploding. Once it has reached the altitude of 20km (65,000ft), it's will end its ascent. Then, as Google explains: "Signals are transmitted from the balloons to a specialized Internet antenna mounted to the side of a home or workplace that use radio frequency technology. "The Internet antenna is connected to a consumer grade router. Web traffic that travels through the balloon network is ultimately relayed to ground stations, where it's connected to pre-existing Internet infrastructure, like fiber cables and our local telecommunications partners." However, won't any balloon filled with helium, however large and resistant to the elements, just float away on the breeze once it takes to the skies? How can it bring consistent coverage to an area if we can't control where they are? Well Google says its Loon balloons are steerable from the ground. At stratospheric altitudes (twice as high as commercial aircraft fly, so there'll be no unfortunate accidents) wind currents tend to move in very specific directions. 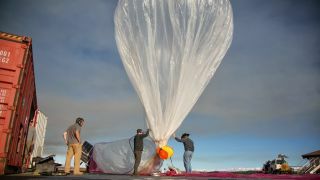 Google's Loon uses a custom-built, solar-powered pump to carefully inflate or deflate the balloon remotely from the ground. The idea is that each balloon rises and falls to the required height in order to move in the required direction at the required speed. From they're, they're like sailboats, which Google says will eventually be able to stay in the air for 100 days at a time. When they reach the end of their shift, they can be directed to a designated rescue centres around the world and replaced. As each balloon is able to communicate with its fellows, it'll move accordingly to ensure that, while doing these laps around the world, the balloons remain a sufficient distance from a colleague. The result? A balloon is always in range for the folks on the ground. "Is it possible to have a nicely spaced out flock of balloons? The answer is yes. Once people could see this was possible, it became a feasible project, not some crazy science project," said Dan Piponi, a Rapid Evaluator for Project Loon. Next Page Project Loon: will it work?